Daniel Gaynor represents and counsels businesses in a variety of matters, including: complex commercial litigation, appellate litigation, employment litigation and intellectual property and trade secret matters. Daniel has represented banks, alternative lenders, telecommunications providers and chemical companies (among others) in federal and state courts throughout the country. The Supreme Court recently resolved a circuit split in favor of the defense bar by holding that named plaintiffs in putative class actions may not transform adverse class-certification decisions subject to discretionary interlocutory appeal under Rule 23(f) into final orders ripe for immediate appellate review as of right under 28 U.S.C. § 1291 by voluntarily dismissing their claims with prejudice. See Microsoft Corp. v. Baker, No. 15-457, 582 U.S. __, 2017 WL 2507341 (2017). This opinion represents a significant victory for defendants faced with putative class actions, as it removes a tool from plaintiffs’ arsenals and neutralizes leverage they otherwise may have asserted to obtain high-dollar settlements. In Baker, the plaintiff-respondents filed suit against Microsoft on behalf of a nationwide class of Xbox 360 owners alleging a design defect that caused the Xbox 360 to scratch (and thus destroy) game discs. The district court struck the plaintiffs’ class allegations—the functional equivalent of an order denying class certification—and the plaintiffs petitioned the Ninth Circuit for permission to appeal that ruling under Rule 23(f) of the Federal Rules of Civil Procedure. The Ninth Circuit denied the petition. Rather than litigate their claim to final judgment, at which point they would have been entitled to an appeal of right under 28 U.S.C. § 1291, the plaintiffs stipulated to dismiss their claim with prejudice but noted that they intended to “appeal the . . . order striking their class allegations” after the court “entered a final order and judgment.” After the trial court granted the stipulated dismissal, the plaintiffs filed an appeal under Section 1291—not of the order of dismissal, but of the trial court’s order striking their class allegations. On appeal, the Ninth Circuit held that it had jurisdiction under Section 1291, despite that section’s language limiting appeals of right to “final decisions of the district courts of the United States,” and reversed the trial court’s order. 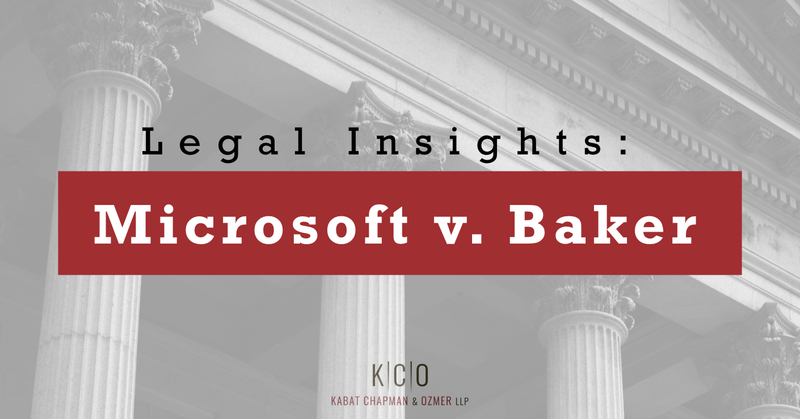 Microsoft then appealed the Ninth Circuit’s decision to the Supreme Court, which granted certiorari. The Supreme Court ultimately reversed the Ninth Circuit, holding that it did not have jurisdiction under Section 1291 to review the trial court’s order striking class allegations. Instead, the appropriate vehicle for the plaintiffs to challenge the adverse class-certification order was Rule 23(f), which vests courts of appeals with discretion over whether to consider interlocutory challenges to such orders. The Court noted that to hold otherwise, and allow plaintiffs to create a final order by voluntarily dismissing their claims following an adverse class-certification order, would unilaterally benefit plaintiffs, invite protracted litigation and piecemeal appeals, and allow essentially indiscriminate appellate review of interlocutory orders. For these reasons (among others), the Court rejected the plaintiffs’ attempt to evade the discretionary nature of interlocutory appeals under Rule 23(f) by trying to utilize the mandatory nature of final-judgment appeals under Section 1291. Baker thus marks a victory for defendants faced with putative class actions. Please reach out to contact us directly for additional insight into Baker and other class-action jurisprudence.